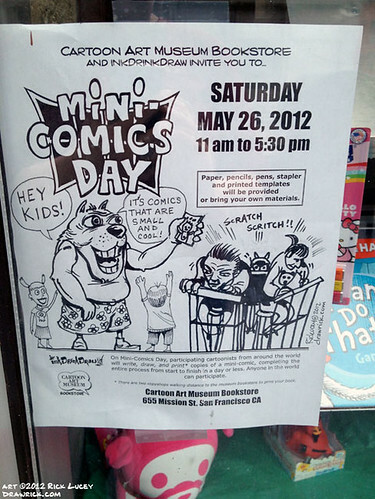 Mini-Comic Day in San Francisco is Tomorrow! 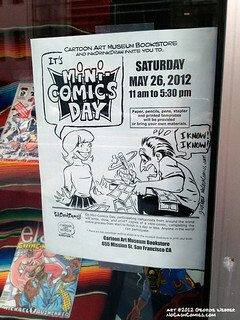 Mini-Comic Day in San Francisco will be held tomorrow (May 26, 2012) at the Cartoon Art Museum Bookstore organized with local artist group inkDrinkDraw. The event will be held from 11am to 5:30pm in the museum’s lobby and is FREE to anyone who wants to participate. We will have basic materials on hand (paper, pencil, pencils, stapler) and there are copy stores nearby to finish the challenge by reproducing your book to give away, trade, barter, sell, etc. Of course you can bring your own materials to work with too as well as copies of your own mini-comics that you can sell during the event. But if you need more convincing to come on down there is also the Museum itself with it’s excellent new exhibits: Mad Magazine, Avengers Assemble, Darth Vader and Son, and La Raza Comica: A celebration of the Latino-American experience in the Comic Arts. I have seen all four exhibits and I can safely say they are some of the best shows the museum has shown. We hope to see you tomorrow! AND stay tuned to this site to see the final results next week. Participants in Newcastle celebrated Mini-Comics Day a month early this year… and it was a huge success. Read more about their event here. 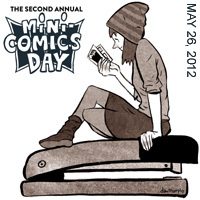 Mini-Comics Day will be happening around the world in a little over a month, on May 26th. Last year on the first Mini-Comics Day I was inspired to draw one (Beholder of the Eye), so even if no one shows up, at least I’ll produce an annual 8-page work. Holding an event like this in a rural area might seem insane, but on the other hand my county produced painter Robert Motherwell, comic artist John Workman (who I was acquainted with as a fellow hangerouter at Eaton’s Bookstall in Aberdeen in the early 1970s), music artists Kurt Cobain and Krist Novoselic, and the wonderful author Angelo Pellegrini. So it is always dangerous to underestimate this obscure edge of the U.S. of A. 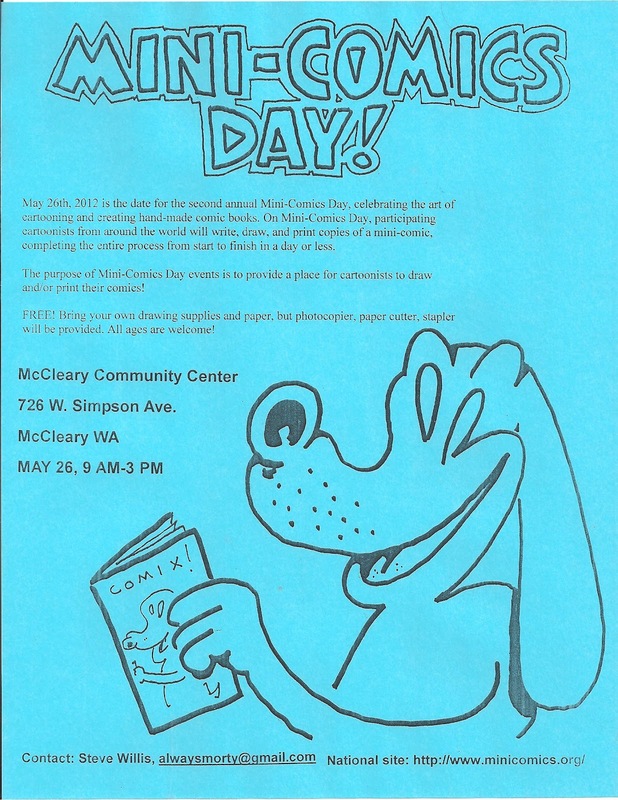 May 26th, 2012 is the date for the second annual Mini-Comics Day, celebrating the art of cartooning and creating hand-made comic books (the first event was held April 9th, 2011). 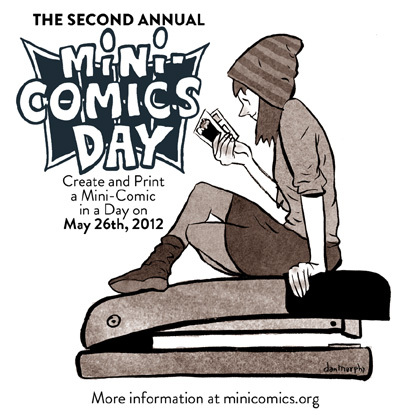 Guidelines: To participate, create a mini-comic from start to finish on May 26th, 2012 (including writing, drawing and printing it). You can make your mini-comic by yourself or with other artists. Also, you may want to consider trading copies by submitting some to the Mini-comix Co-op. Events: Mini-Comics Day events will be organized at different locations around the world. You can read more about how to organize an event in our FAQ. The purpose of Mini-Comics Day events is to provide a place for cartoonists to draw and/or print their comics, and possibly to trade or sell their minis if they choose to. In 2011, we had 17 event locations participate internationally. If you would like to organize an event, contact us at so we can promote your event and add it to our event listing.